Home » About Us » First Time Visitor? Are You a First Time Visitor to our Church? Coming to any church for the first time can be an intimidating event. You are entering into someone else's world and trying to find a way to fit in. I hope that these tips will help to make your first experience with us less overwhelming and more filled with the presence and love of God for you! Click here also for a great and, we hope, helpful article by Frederica Matthewes-Green entitled 12 Things I Wish I'd Known... Her witty and direct descriptions of what goes on during an Orthodox worship service will, we hope, make you feel a little more at home. Our parking lot is behind the church, off of the tiny side street, named Chapel Street, next to the church. The entrance is between the back of the church and the white Parish House. You may part anywhere. If, by chance, the lot is full, we have permission to park across the street in the parking lot of the Democratic Headquarters and of the DCYF. Unfortunately, we do not have a Parking Lot Team. If you are not sure you are parked in the right area, just ask one of the Council Members at the front of the church. If you like a more formal entrance (or if you have parked across the street), you can also go around to the front of the church and go up the monumental staircase. This will also lead to the Narthex. If you need a handicapped entrance, however, you do need to use the Chapel Street door and go to the elevator. On your way through the Church Hall to the elevator or stairs, you will see the restrooms. The Men's Room is on the left; the Ladies' Room is on the right. If you see something wrong or dirty in the restrooms, please tell one of the Council members in the Narthex. What is this strange Narthex thing? 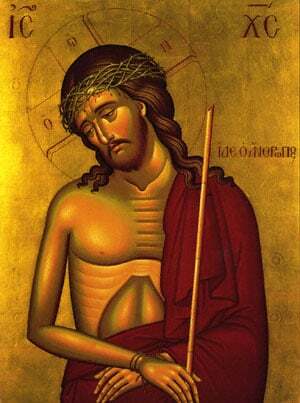 Everything in Orthodoxy is meant to be a way of looking into the reality of the Kingdom of God. Even the way our churches are built and arranged tells us something about the Kingdom. One thing that the church building itself symbolizes is the world, both physical and spiritual. The Narthex, or Entrance Hall, is seen as a transitional space between the fallen world of sin and death and the world of redeemed creation already participating in the Kingdom of God. In the Narthex you will see stands with beeswax candles, candle stands filled with sand, and icons. When entering the Narthex, Orthodox Christians will take a candle (some will take more than one) after putting a donation in the basket, go to one of the candle stands, light their candle from the ones already there, and place it in the sand. They will pray for both the living and the dead. Then they will go to the icons on the stands flanking the doors and kiss them. Think of it as greeting your friends when you go to visit them. You are being welcomed into the house of God, the Kingdom of Heaven, where all the blessed live in the presence of God. They are inviting you to join them in their home, into God's presence. In the Narthex you will also find a member of our Welcome Team, who will give you a copy of the Bulletin, which contains the hymns and readings of the Liturgy and other parish information. If you have any questions or concerns, please do not hesitate to ask. They are there to help you feel more comfortable! Also this is where you will see members of the Parish Council taking care of practical aspects. You may also ask any questions of them; just remember that they may be busy, so they may not be able to address your questions or concerns immediately. Depending on your religious tradition or background, you may find the service somewhat familiar or totally bizarre. Don't worry either way! Join in praying and singing, if you like, or just put yourself in God's presence and observe the service with an open heart and mind. There is a red Liturgy Book in the pew to help you follow the service. Please do not be embarrassed to ask someone to help you follow along. People are always glad to help! Because many of our parishioners come from Greece and feel most comfortable worshipping in their native language, about half of the service employs Greek, although it is an ancient form of the language. About half of the service, then, is in English, including the reading of the Epistle and Gospel. Please bear with us as we try to accommodate the needs of all our people; for the parts in Greek, you can follow along in the Liturgy Book until you are more familiar with the service. Much of the ritual of the Orthodox Church has its roots in Jewish Temple Ritual, although understood in a new and fulfilled way in Christ. One of these rituals is the use of incense. A various times throughout the service, the priest will come out of the main doors of the altar with a censer and incense, and cense the icons and the people. The incense has three fundamental meanings: 1) It is a sign of honor to the bearers of God's presence, the saints and the people of God; 2) it is a symbol of our prayers rising up before the throne of God; and, 3) It is a symbol of the presence of the Holy Spirit among us, who cannot be seen but whose presence can be sensed by the soul. Despite the beautiful meaning of the incense, some people have respiratory problems that can be affected by the incense. If this is your case, please inform the Welcome Minister and ask to sit as close to the back as possible. You might find the fact that the altar and the priest are "hiding" behind a big wall, filled with religious pictures. This "wall" is called an Icon Screen (in Greek, iconostasis). This wall developed over the centuries, especially because of the understanding of the awesomeness of the Holy Mysteries being celebrated. We see it, however, not as a dividing wall, but as a joinging wall between heaven and earth, and the pictures (or icons) of Our Lord, His Mother and the Saints and Angels depicted on the icon screen are welcoming us to come deeper into the mystery of the Kingdom of Heaven. 4) Why is the priest's back to me? Unlike in many other Christian worship services where the sermon is given prominence, in the Orthodox Church the priest is not the center of focus. His role is to stand at the head of the people, to unite them in prayer, and to stand in the role of Christ, to bring His most holy Body and Blood to the people in Holy Communion. And so, like the whole Body of Christ assembled in worship, the priest also faces East. The posture comes from antiquity, and was the common direction which both Jews and pagans faced while praying. For the early Christians this was especially important; the rising sun was a symbol of the risen Christ bringing the light of the Kingdom into the world.